Through the work of Hire Our Heroes, Helovets and A.S.T Landscape Services Inc., we are extremely excited to have Tommy as the newest addition to an already exemplary team of Veterans. Tommy is another fantastic addition to our growing Military Veterans population. I have worked and continue to be friends with not only CSM’s, however Senior NCO’s. They do not like to have their pictures displayed or their accolades mentioned as they are a very humble group. Thus, I wanted to make sure that A.S.T. recognizes Military Veterans and their families for the difference they made and will continue to make to this great Nation and across the globe. Tommy, our entire A.S.T. team gives you a heartfelt thank you and thank you to your remarkable spouse SFC Candice Williams for the outstanding service to our Country. While she continues to serve and your family’s remarkable dedication, honor and decorated service to the greatest Nation in the world is truly revered and appreciated. God Bless Brother-Your A.S.T. Family! CSM Thomas Williams was born and raised in Pulaski, TN. He enlisted in the United States Army, June 1995 and attended Basic Training and Infantry Advanced Individual Training at Fort Benning, Georgia. His previous positions and duty assignments include: Squad Automatic Riflemen, M240; Machine Gun Team Leader; Rifle Fire Team Leader; Rifle Squad Leader; Rifle Platoon Sergeant while serving with C Company, 1st Battalion, 75th Ranger Regiment. Moreover, Reconnaissance/Sniper Platoon Sergeant and Assistant Operations NCO, HHC, 1st Battalion, 75th Ranger Regiment; Rifle Company First Sergeant, B Company, 1st Battalion, 75th Ranger Regiment, Hunter Army Airfield, GA.
Additionally, CSM Williams career path continued with the following duties: HHC/Ranger Selection and Training Company, RSTB, 75th Ranger Regiment, Fort Benning, GA; Division G3 Training SGM, 1st Infantry Division; Battalion Command Sergeant Major, 2nd Battalion, 16th Infantry Regiment, 4th Infantry Brigade Combat Team, 1ST Infantry Division, Fort Riley, KS. CSM Williams’ final assignment was the United States Army Sergeants Major Academy, Fort Bliss, TX where he served as the Dean of Professional Military Studies and Executive Director of Staff and Faculty. He has deployed in direct support of both Operation Enduring Freedom and Operation Iraqi Freedom (13) times as a member of a Joint Special Operations Task Force. His positions held during combat operations include: Assault Force Leader, Ground Force Commander, Joint Task Force (JTF) Liaison and JTF SGM. CSM Williams deployed with Task Force 2-16 to East Africa as a member of Combined Joint Task Force Horn of Africa in direct support of Operation Enduring Freedom – Horn of Africa where he served as TF 2-16 CSM and the Senior Enlisted Leader for all Army personnel. CSM Williams’ military schooling includes Commandants Pre-Command Course, Brigade and Battalion Pre-Command/CSM Courses, Command Sergeant Major Development Program, all NCOPDS courses, including the United States Army Sergeants Major Course (Class 62), Army Force Management Course, Command Sergeants Major Legal Orientation Course, United States Army Ranger School, Airborne School, Pathfinder School, Jumpmaster School, Survival Evasion Resistance and Escape (SERE) Level C; and SERE 245. Additionally, he has completed Explosive Entry for Rangers Breaching Courses (Basic/Advanced), Dynamic Entry Breaching Course, Assault Climbers Basic Course, Barnhart Advanced Shooting Course; Rifles Only Long-Range Shooting Course, French Desert Commando Course, Combat Lifesaver Course, Ranger First Responder Course, Tactical Combat Casualty Care Course, Senior Training and Education Managers Course and Faculty Development Program, Phase 1 & 2 Courses. CSM Williams’ civilian education includes a Bachelor’s Degree in Social Science from Upper Iowa University, a Master’s Graduate Certificate in Project Management from Villanova University, and a Master’s Degree in Public Administration from the University of Texas at El Paso. CSM Williams’ awards and decorations include: Legion of Merit, Bronze Star Medal (2),Defense Meritorious Service Medal, Meritorious Service Medal (4), Joint Service Commendation Medal, Army Commendation Medal (5), Joint Service Achievement Medal (2), Army Achievement Medal (4), Valorous Unit Award, Joint Meritorious Unit Award, Good Conduct Medal (7), National Defense Service Medal (2), Global War on Terrorism Expeditionary Medal (2), Global War on Terrorism Service Medal, Afghanistan Campaign Medal (3), Iraq Campaign Medal (5), Non-Commissioned Officers Professional Development Ribbon (5), Army Service Ribbon, NATO Service Medal (Iraq/Afghanistan/Sudan) and the Overseas Service Ribbon (3). 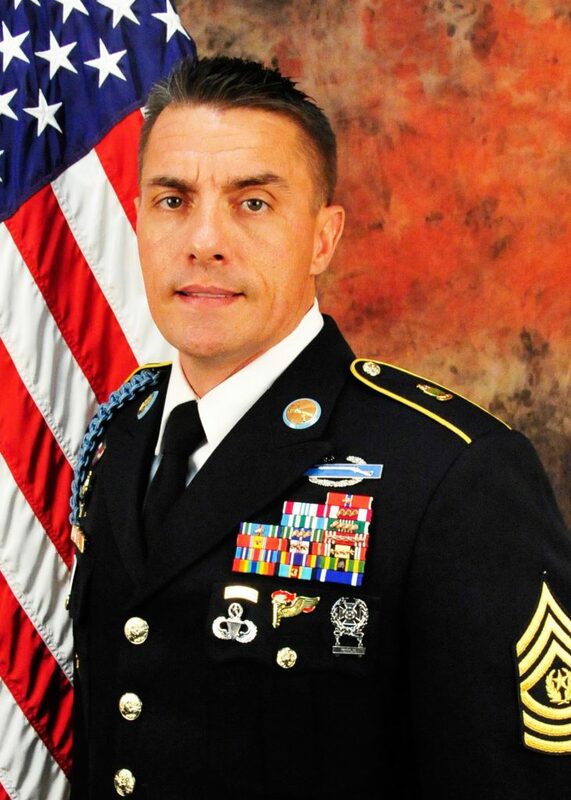 He has also been awarded the Combat Infantryman Badge, Expert Infantryman Badge, Ranger Tab, Master Parachutist Badge, Pathfinder Badge, Army Physical Fitness Badge, and multiple foreign decorations including German, South Korean, and South African Parachutist Badges and the French Desert Commando Badge. CSM Williams is also the recipient of the National Infantry Association Order of Saint Maurice: Legionnaire Award and the United States Field Artillery Association Order of Saint Barbara. CSM Williams’ civilian affiliations include: Centurion Military Alliance Board of Directors, Fort Worth Chamber of Commerce, University of Texas at El Paso (UTEP) Alumni Association, UTEP Public Administration’s Board of Advisors, Upper Iowa University Alumni Association, Project Management Institute, Student Affairs Administrators in Higher Education (formerly known as NASPA), Phi Alpha Alpha Honor Society, Association of the United States Army, United States Army Sergeants Major Association, National Infantry Association, United States Field Artillery Association, 75th Ranger Regiment Association, 1st Infantry Division Association, Armed Services YMCA, Veterans of Foreign Wars and the American Legion. CSM Thomas F. Williams is married to SFC Candice D. Williams formerly of Las Cruces, NM. They have two daughters, Karina and Karolina. They own Full Disclosure Background Screening and currently reside in Fort Worth, TX. CSM Williams will officially retire from the United States Army on February 1st, 2018 after serving our country for over 22 years.